11 years. 20 movies. That's how long before the first female-led film in the Marvel Cinematic Universe was made. Although I am glad to see a female-led superhero film, I'm a bit saddened that it took this long. But ultimately, the wait was worth it. Captain Marvel is one of the best films in the MCU. 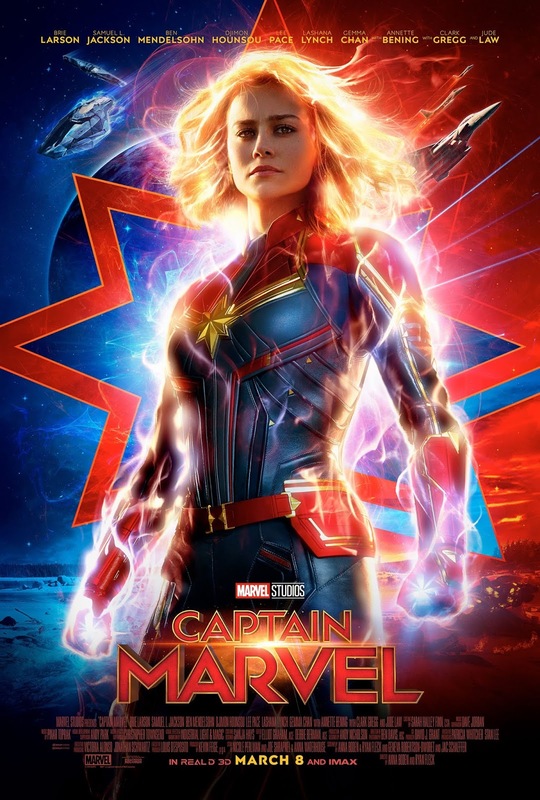 Set in 1995, the film follows Carol Danvers, AKA Vers, AKA Captain Marvel (played by Brie Larson), a member of the Kree military group Starforce on the planet Hala. Led by Yon-Rogg (played by Jude Law), Vers, along with Korath (played by Djimon Hounsou), Minn-Erva (played by Gemma Chan), Alt-Lass (played by Algenis Pérez Soto) & Bron-Char (played by Rune Temte), along with the assistance of Ronan the Accuser (played by Lee Pace), Starforce is the elite military group leading the fight against the shape-shifting Skrulls. Although Vers has terrific powers, she is advised by Yon-Rogg & the AI Supreme Intelligence (played by Annette Bening), who appears to someone as someone the person knows from the past, to keep them in check. However, Vers does not know who Supreme Intelligence is supposed to be in her life. An ambush against the Skrulls fails & Vers is captured by their commander Talos (played by Ben Mendelsohn). She eventually escapes & crashes on Earth. The next morning, she is confronted by S.H.I.E.L.D. agents Nick Fury (played by Samuel L. Jackson) & Phil Coulson (played by Clark Gregg), who are investigating the crash landing. Their investigation is stopped when Skrulls attack. Fury is stunned to see Vers' powers & the Skrulls, & works with her to discover more about herself & them. With the memories she has, they go to the Project Pegasus area at an Air Force base, where Vers makes a startling discovery: Vers is Carol Danvers, a former Air Force pilot who was presumed dead in a crash in 1989 along with Dr. Wendy Lawson, AKA Mar-Vell (played by Annette Bening). Carol & Fury travel to Louisiana to find Maria Rambeau (played by Lashana Lynch), Carol's best friend who was the last person to see her before she died. Maria helps Carol fill in some of the blanks about her past. Talos arrives & warns her about her past on Hala. This forces Carol to rethink her past, present & future & who she is really fighting for. The cast is fantastic. Brie Larson shows that she is perfectly capable of holding her own in a major blockbuster, & has the right mix of charm & stubbornness for the role. Ben Mendelsohn is terrific. Samuel L. Jackson is wondrous once again. And the rest of the cast provide great supporting performances. The direction by Anna Boden & Ryan Fleck is excellent. Boden & Fleck perfectly mix the awesome cosmic feel with a calm down-to-earth realistic approach that really fits the film. The screenplay by Anna Boden, Ryan Fleck, Geneva Robertson-Dworet, Nicole Perlman & Meg LeFauve is amazing. The plot is thoroughly intriguing, the characters are fully realized, & the dialogue is very well-written. Ben Davis' cinematography is spectacular. Davis' framing is very well-done, & the shot composition is even better, especially several nighttime shots in the middle of the film. The editing by Elliot Berman & Debbie Berman is superb. The film is tightly paced & superbly cut, using quick cutting in a good way. The makeup & hairstyling is impressive. The makeup looks absolutely stunning with the immersive blue makeup of the Kree & the green makeup of the Skrulls. The sound design is impeccable. The sounds race across at blistering speeds, & are perfectly edited & mixed for an immersive experience. The visual effects are stunning. The CGI is very well done, especially the de-aging of Jackson & Gregg. There's not a single flaw. And Pinar Toprak's score is incredible. The score is driven by synthesizers, definitely emphasizing the film's cosmic feel & the film's timeframe. This is the best origin story in the MCU. It has a terrific cast, a dynamic group behind the camera, & a lot of heart to make it a truly extraordinary experience. Captain Marvel was seen by me at the MJR Marketplace Digital Cinema 20 in Sterling Heights, MI on Friday, March 8, 2019. It is in theaters everywhere. Its runtime is 124 minutes, & it is rated PG-13 for sequences of sci-fi violence & action, & brief suggestive language.